What worked in the past will not automatically work in the future. We need to update and diversify our peacebuilding approaches. In our current context, this includes a greater emphasis on engaging with religious-political actors with constituencies, even if their worldview is very different to our own. After the Second World War, we invested in an international system that was relatively effective: the number of deaths from violent conflict, on both an aggregate and per capita basis, decreased rather precipitously. And with that drop in violent conflict, respect for human rights and countless other measures of well-being increased dramatically through the turn of the century. Even with their apparent deficiencies and drawbacks, the UN and other multi-lateral systems seemed overall to be fit for purpose. However, there are two forms of conflict we are currently largely failing to address: First, weak and collapsing states such as Rwanda in 1994 or Syria and Yemen today, which destabilize whole regions. Second, transnational violent groups, be they ideologically inspired on the one hand or international gangs and cartels on the other. The post-World War Two international conflict prevention and resolution system, predicated as it is on state sovereignty and state-action, has proven largely incapable of dealing with these manifestations of conflict, at times even worsening crises. A common thread that drives these two challenges is the exclusion of actors from the political and socio-economic sphere. Youth that have no economic opportunity, who are marginalized from politics or who are mistreated by the state security apparatus are especially vulnerable to recruitment to violent causes. This reflects a larger global dynamic of detachment between state and multi-lateral institutions on the one hand and the people they are intended to serve on the other. The encouraging picture of globalization reflected by the gatherings of elites from over 100 countries seeking to solve problems at venues like Davos begins to appear more like a veneer when so many of them seem to be increasingly disconnected from the vast majority of people in their home countries. Elites are not the problem – after all, sustainable change is driven both top-down and bottom-up. But the gap between the agenda setters and policy-makers on the one hand and the people on the other, is fertile ground for instability and violent movements. 1. Engage with excluded actors who have a constituency. Working with certain actors may not be palatable to those in power, but they may need to be involved in peacebuilding so as to pave the pathway for their non-violent inclusion in politics. Historically some peacebuilders have reflected their own biases, tending to engage with like-minded actors and thus ignoring critical stakeholders such as the security sector, corporate leaders and/or conservative religious actors. The peacebuilding field has largely evolved to a more inclusive and thus effective approach but we must always explore better ways of engaging with such actors. This requires listening and trying to understand those that hold different worldviews than our own. There is evidence that actors become constructive participants in societies not because others have agreed with them, but because they have the experience of being heard and respected by others. We do not need to agree with such actors – but we must try and understand them. To this end, we should not limit who we are ready to talk with and listen to too quickly or too narrowly. Because if we do, the limits are set by our own prejudices, and we become part of the exclusionary politics that drive violent conflict. 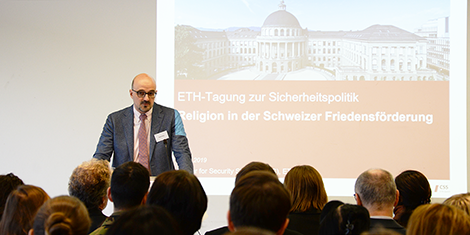 The Swiss Federal Department of Foreign Affairs’ (FDFA) peace promotion activities focusing on religion, politics and conflict have been a pioneer in this regard, with a specific focus on how to engage with religiously inspired political actors. 2. Support platforms for actors to jointly search for practical solutions to shared problems. Relationships between diverse religious leaders, as well as between religious leaders and leaders of other sectors (security, judicial, civil society, etc.) need to be built and fostered. Supporting such diverse communities to identify and deal cooperatively and practically with shared concerns as mundane as providing recreational opportunities for youth or improving trash collection is a more effective pathway to building trusting relationships than engaging them in ideological or theological debates and public posturing. a. Change institutions. Frontline peacebuilding shows that change always starts with individual people and relations between groups, but to be enduring, institutions and policies need to change. A dispute between two clans, for example, may be mediated, but if the underlying land rights policy is not transformed, conflicts will likely re-occur. b. Shift social norms. In some cultural contexts, intangible social norms – i.e. what a critical mass of citizens believe their society will accept and expect – may be as important to intergroup relations and behaviors as institutional policies or laws. Thus, peacebuilding needs to equally focus on strengthening social norms of collaboration and non-violent conflict resolution, such as through theater, films, social media and radio programs. For example, our Niger team uses community theater to open and then facilitate intra-communal and intra-generational dialogues about conflict-causing practices, sometimes leading to widely-embraced changes even in age-old practices like child marriage. c. Catalyze local markets. Focusing on how to create local supply, demand and capital for peacebuilding approaches – such as catalyzing the emergence of robust markets for local mediation services – can help ensure that these approaches take root and grow without continued reliance on external support from international peacebuilders or donor agencies. Achieving enduring change through this approach requires time – we need to think in terms of one or two decades, not one or two years. Furthermore, it requires identifying and supporting local champions for peace – including both state and non-state actors. Such local champions always exist, but we need to get better at recognizing and supporting them. Complementing state-to-state diplomacy with this kind of local citizen-driven peacebuilding is the key to building peace and security in our current tumultuous context. Shamil Idriss is the Chief Executive Officer of Search for Common Ground, the world’s largest dedicated peacebuilding organization. In his current capacity as CEO, and in his previous capacities as President, Chief Operating Officer, and Burundi Country Director, Shamil has led Search’s efforts to end violent conflict in more than 35 countries globally, including some of the most devastating conflict zones in the Middle East and Africa.